The QuickWood Sanding star wheels 4" Diameter are used in a drill chuck and the flexible star wheels can sand any contour or profile you give it. This is a little different then the flap-wheels as the sanding can be more aggressive with the star wheels. 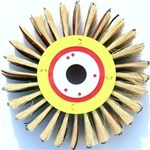 The star wheels are often used for much more aggressive sanding then the Flap wheels. Now this tool has the right weight at 4 lbs it will work well with a drill. The head comes with a 1/2" drill pin coming out from the head, the head is 2" in width and it takes 3 twisted steel heavy duty rustic brushes. The weight of the tool is really important and this one feel good at 4 lbs. You can use this tool with a hand held drill and you can do 2" at a time for distressing. This will for sure be a top seller in the distressing market as its light weight but heavy duty distressing. Make the distressing as deep as you want or light as you want the pressure you put on this tool will make the product as you want . Quickwood sanding sponges are virtually indestructible as they are made from a new adhesive and grit combination. Size 4 3/4" x 3 7/8" x 1/2" thick. Abrasives on both sides. This has given the Quickwood sponge greater cutting power and a longer life span. Tests have shown us that Quickwood out-performs any other sanding sponge on the market today! This power tool is air driven with 90-110 bars of pressure. This listing includes a P150 grit Flap-Wheel Head with the machine. All hoses and a dust shield comes with the machine.